U.S. Navy Senior Chief Bryan Cummings, inside the tank back center, communicates with visitors as his wife, Angela, seen in the foreground, prepares her cell phone camera for recording at the Tennessee Aquarium Thursday morning. U.S. Navy Senior Chief Bryan Cummings, left, gets last minute tips for using a communications mask from First Class Petty Officer Eli Knotts before his dive and talk with Tennessee Aquarium onlookers Thursday morning. 5-6 p.m.: The U.S. Fleet Forces Band’s brass band ensemble will perform a one hour concert on the Riverbend Festival Unum Stage. 12:30-1:30 p.m.: The U.S. Fleet Forces Band’s brass band ensemble will perform a one-hour concert at the River Market at the TN Aquarium. 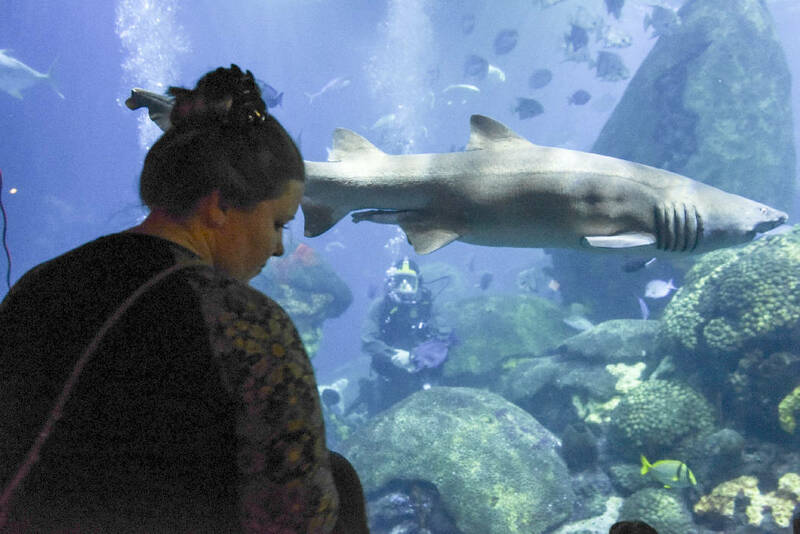 A small crowd of children sat in the dark at the Tennessee Aquarium on Tuesday, faces pressed against the thick glass of the Secret Reef exhibit. Sharks, turtles and schools of saltwater fish swam in front of them, and as they watched, an unusual scene unfolded — two Navy explosive ordnance disposal experts in full dive gear sank to the bottom of the tank. Lt. Jacob Phillips and Senior Chief Bryan Cummings came to Chattanooga as part of Navy Week, making Chattanooga one of only 14 cities in the country to participate in the event, which is designed to teach residents about the Navy, its personnel and the role it plays in ensuring national security. Floating at the bottom of the Secret Reef tank while speaking through a set of speakers where the kids were sitting beyond the glass, Cummings played his part by talking about his work, highlighting how science, technology, education and mathematics play a part in their day-to-day lives. "There's a lot of things that can go wrong when you dive," he said. "You've got to make sure you're aware of and on top of all those whenever you go out." He walked through the training required to become a Navy diver before explaining how they search for and either defuse or remove underwater explosives. He encouraged kids to stop by a display in another room that held some of their equipment, including a helmet that allows personnel to dive approximately 300 feet underwater. "That's called the Cadillac because it's the best one we have," he said. "We also have a robot that we can send down when we don't want to send a person." An aquarium employee took a handful of questions from the crowd, including Cummings' 9-year-old daughter, Leah. She said it was the first time she'd seen her dad work firsthand. "How does it feel down there?" she asked. "Right now, it actually feels pretty cold," he chuckled as the aquarium employee rattled off information about the cool climate of the tank. Lt. David Carter, who works in the Navy's office of community outreach, said Navy Week is intended to share information about some of their work both home and abroad. "Our hope this week is that we can leave Chattanooga a little more informed about what their Navy is doing around the world while reinforcing the importance of STEM education," he said. "Here we were able to show them face to face." He said the event presented a unique opportunity to engage with the public and served as a reminder of how much residents support their service members. "It's one thing to know the American public is behind you. It's another thing to see it face to face. To have those handshakes and the pats on the back," he said. Once out of the tank, Cummings shivered slightly as he slipped out of his dive gear. A Chattanooga native, he's served 21 years in the military and said he was happy to see his family on the other side of the glass, even if they've been to the aquarium a few times before. "I'm glad they got to see it," he said. "Now I think I'm going to throw some clothes on and walk through the rest of the place with them." Contact staff writer Emmett Gienapp at egienapp@timesfreepress.com or 423-757-6731. Follow him on Twitter @emmettgienapp. Correction: A calendar of events from the U.S. Navy listed an event Sunday, June 17. Navy Week will end Saturday. There will not be an event Sunday.